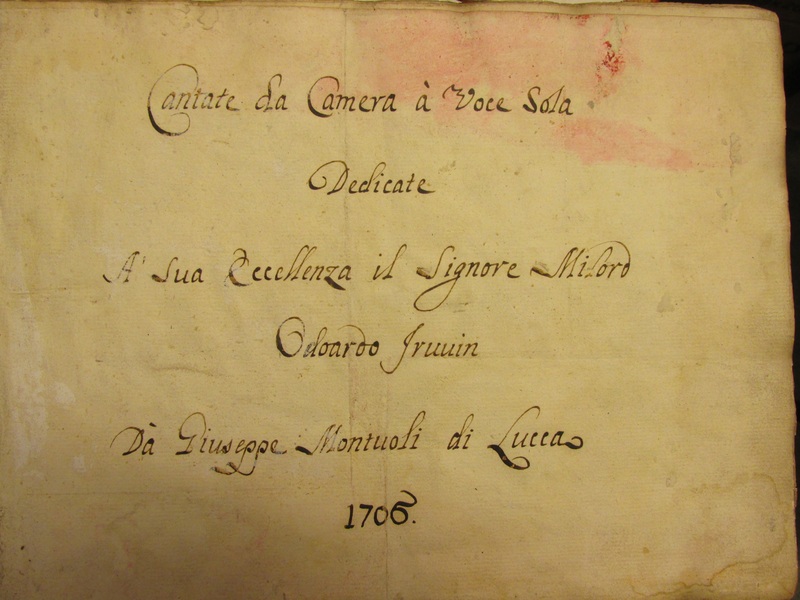 One of the rarest items in the archive of our Music and Performing Arts Library has to be the manuscript of a Cantate di Camera à Voce Sola written by Giuseppe Montuoli of Lucca and dedicated to “Signor Milord Eduardo Irwin and dated 1706. This refers to Edward Machel Ingram, 4th Viscount of Irvine (1686–1714) one of nine sons of the 3rd Viscount five of whom went on to succeed to the title. In 1704 Edward set off on the customary “Grand Tour” which took him and one of his brothers, Richard, on an extended three year trip around Europe. 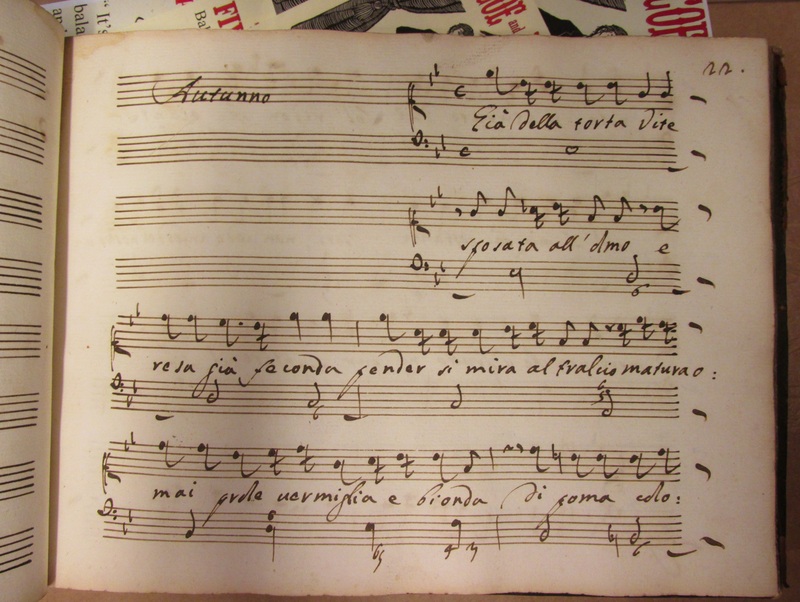 Edward accumulated various artworks, furnishings, musical instruments, and books throughout his travels including (rumour has it), an Italian Diva who he may have intended to marry. Nonetheless, when Edward died in 1714 he was unmarried the title passed to several of his brothers in turn. Edward’s nephew the ninth Lord Irvine died in June 1778 leaving no male heirs to inherit and the title became extinct. That might be the end of the story of the connection between the Montuoli manuscript and the Irwin title. In 1912, well-known local music historian Frank Kidson wrote a note addressed to “The Hon Edward F. Wood” who had inherited the Temple Newsam estate following the death of his aunt in 1904. 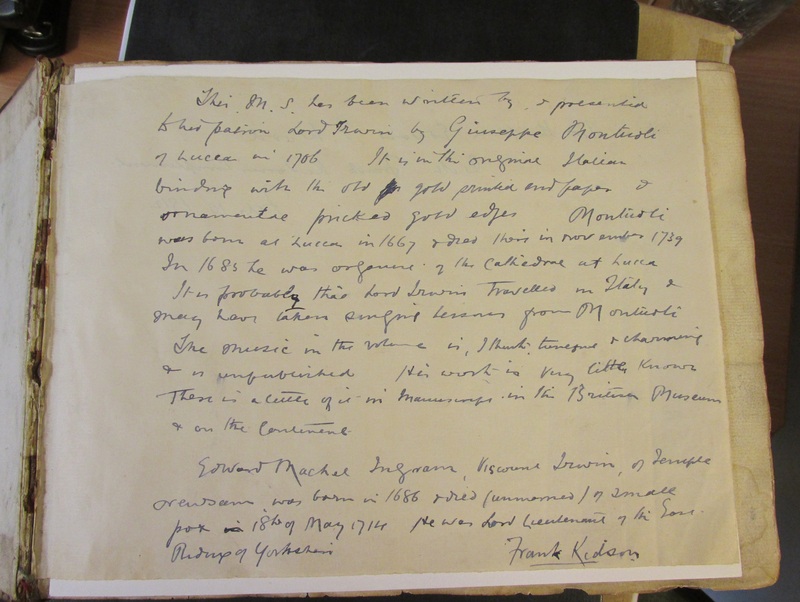 The note outlines the history of the Montuoli manuscript. We are not sure how Kidson obtained the manuscript although there is a note in the inside cover mentioning that it cost him the princely sum of 7 shillings (35p) in 1906. By 1922 the manuscript seems to have returned to its home at Temple Newsam. It is listed in the contents when Edward Wood sold the house, but not everything in it, to the City of Leeds and many of the items in the house were sold. So how does that link to the Irwin title? For a brief time between 1925 and 1934 Edward Wood, later to become famous as Churchill’s war-time sparring partner Lord Halifax, took the title Lord Irwin.